This Colorado River adventure is an intense experience on many levels, physical, mental, and emotional. Even from up close, the sheer scale of the geography in the Grand Canyon is almost beyond comprehension let alone the beauty of the rock layers and how they gradually unfold right before your very eyes. 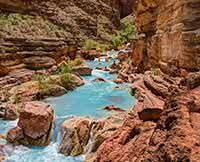 The Colorado River changes too in subtle ways. Add to that the thrill of white water rafting and you have the makings of a permanent memory that will last your whole life. As if that was not enough, you have the camaraderie of perfect strangers which begins to gel almost immediately as the reality of it starts to sink in. After all, you are in a wilderness and soon to be totally cut off from the rest of your "normal" life and from the rest of civilization. The Western River guides, Evan, Joe, and Nash are first class in every way imaginable and it is easy to see why they are the best asset this company has. Without them, none of this would work. While less obvious, it is also easy to see that they have a great support staff back home taking care of the enormous logistics and maintenance required to make a successful trip. You get three fantastic meals per day and fresh "Cowboy coffee" every morning to help you jump-start your "machine". Remember this is a camping trip and if you have never camped before, don't let that scare you off and remember to keep a totally open mind. For some people, that is very hard to do. But if you succeed, you will be amply rewarded for it. If you are sitting at home thinking about whether you will climb Mt. Everest or go to the Grand Canyon with Western River Expeditions, stop wasting your time and head out to the Grand Canyon for an experience you will never forget.